As you know, the Google updates towards the end of December were pretty aggressive and Google even somewhat confirmed some of them. These include what we called the Maccabees updates that seemed to target keyword permutations as well as Fred like stuff and even hit some celebrity sites. 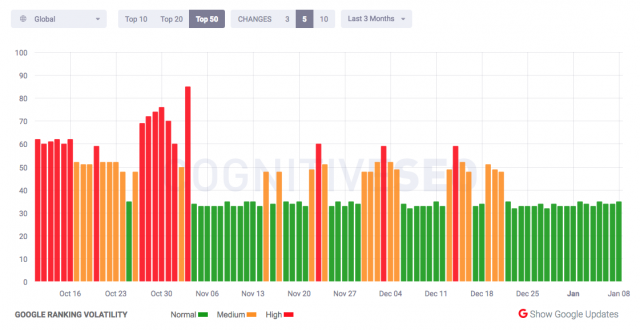 We also saw a PBN penalty roll out and maybe a featured snippets/knowledge graph algorithm update. 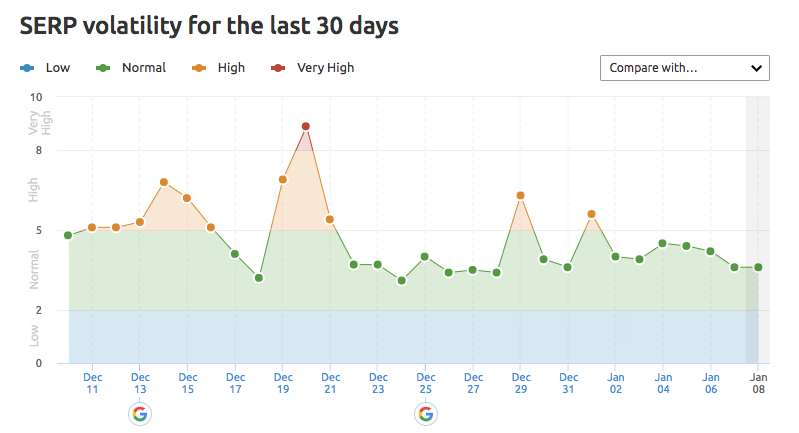 But it seems that while it may have kind of quieted down a bit over the first few days of the new year - starting around January 5th and 6th throughout the past couple days, some webmasters and SEOs are noticing algorithm shifts again. They do not seem as big as the period of the Maccabees update but some are reporting what I would say are tweaks to those algorithm updates from December. After days of dismal traffic and sales conversions, suddenly, like a switch is flipped, site traffic and conversions come back as if it's 10 years ago. Go figure. I'm quite sure we've all seen this type of pattern come, and just as quickly go. Our organic traffic has grown +420% since January 2017. We saw a decent bump on Friday for about 15%. Carried through Saturday. We will see if it sticks next week. All appears to be coming from long tail. Looks like the changes I saw late last week were rolled back. Again, it seems to me these are tweaks to the December updates but I cannot be sure about that. Did you notice changes in the past few days?